Joshua Davis (centre) collects his Man of the Match award from a CWI official after Sunday&apos;s match. PHOTO COURTESY CRICKET WEST INDIES. 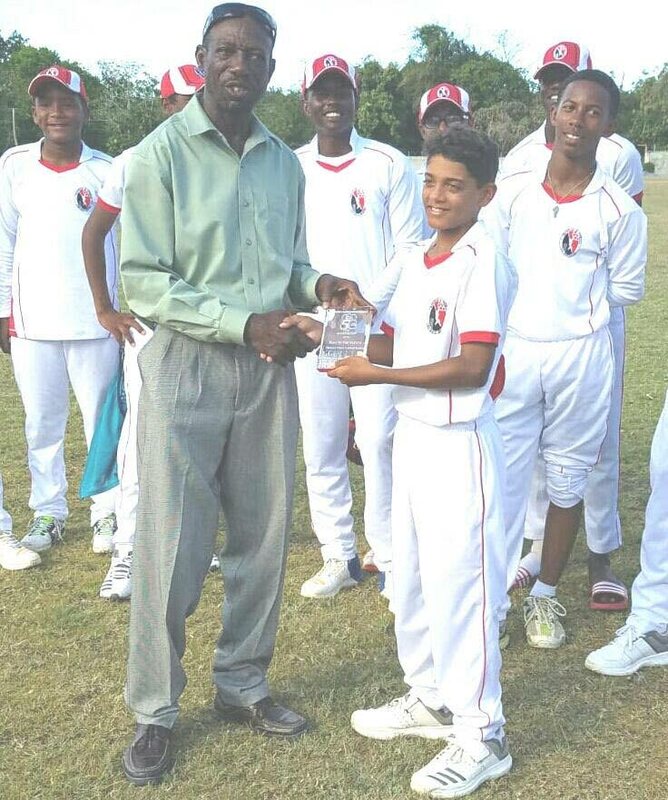 JOSHUA DAVIS had an excellent all-round performance on Sunday, as TT trounced hosts Leeward Islands by 182 runs to notch their second straight win in the Cricket West Indies (CWI) Under-15 Super50 Cup in Antigua. At the Ball Beef Ground in Liberta, TT tallied a score of 295 runs for the loss of seven wickets. In response, the hosts were 113 in 33.2 overs. O James smashed an unbeaten 78 off 57 balls with nine fours and a six, while Davis, grandson of ex-TT and WI opening batsman Bryan Davis, had a knock of 51 (79 balls, six fours). K Ramdoo contributed 47 (69 balls, three fours) and K Boodoosingh made 42 (69 balls, three fours). N Edward was the best bowler for the Leewards with two wickets for 32 runs and A Willet had 2/47. Davis, the eventual Man of the Match, returned with the ball to claim five wickets for 20 runs while Boodoosingh had 2/2 as the Leewards were dismissed with 16.4 overs remaining. Opener D Singh top-scored for the hosts with 25 while Willet had 21 and R Longville 20. Also on Sunday, Barbados got past Guyana by 95 runs and the Windward Islands earned a five-wicket win over Jamaica. The Windwards lead the standings with 13.5 points, with TT next on 12.4 points and Barbados third on 6.2 points. Guyana are fourth with six points, followed by Leeward Islands on 0.7 and Jamaica on 0.2. Third Round matches will take place today with TT meeting Jamaica, Guyana opposing the Windwards and the Leewards tackling Barbados. Reply to "Davis stars as TT trounce Leewards by 182 runs"